In 1903 Sam Day Jr., a trader from the Chinle Trading Post, discovered the earliest documented Navajo textile types collected in a cave known as Canyon de Muerto in Canyon de Chelly, a site of a massacre of Navajo ordered by the New Mexican Gov. Fernando Chacon in the winter of 1804-05. The remnants were primarily banded natural brown and blue blankets, weavings with similar layout of design, but constructed on a wider than long loom, known as chief's blankets soon followed. The term chief’s blanket is actually a misnomer as the Diné (the name Navajo call themselves) are a clan society and don't have designated chiefs. The origin of the name chief’s blanket was derived erroneously from the jargon of Calvary soldiers who classified the blankets as such after seeing Plains Indian chiefs wearing these magnificent Navajo blankets. The Diné would trade a single blanket that may have taken up to a year to weave for several horses. A great Navajo serape or blanket could bring $50 in the mid-1800s. Chief’s blankets fall into four distinctive classification groups based on date of construction and pattern layout. Blankets designated as chief's type are generally woven on a wider than long loom. The earliest type, the first phase blanket, is composed of simple white, brown and blue stripes, reminiscent of those fragments found at Massacre Cave. The sheep wool is of a long staple churro variety that first arrived with the Spanish conquistadors. The colors are natural handspun shades of browns and white, with stripes of vegetal indigo blue, All early chief's blankets use indigo blue coloration. Indigo does not fade, so an easy litmus test to ascertain a blanket’s age, without using spectrophotometry, is to examine the weaving in direct sunlight and look for an iridescent color. Even the smallest amount of fading of the blue, indicates it's not indigo and probably of a later date. First phase blankets are the most rare type of chief's blankets and there are probably at most 100 examples in existence. They stopped being produced by around 1850. One of these blankets recently sold at auction for $1.8 million, though normally one would expect a great example to sell in the $500,000 to $700,000 range. The second phase Navajo chief's blanket, the next generation of design, added 12 small boxes or rectangles laid down on a first phase chief's blanket pattern. These are much more common and were made between 1850 and 1870. Price structure for an outstanding classic example would be in the $125,000 to $225,000 range. The third phase Navajo chief's blanket for many collectors may be the most artistic of the chief's blankets. Composed of nine diamonds or cross formations, these blankets were made from 1860 to 1890. Early pristine examples using all natural colorations and raveled yarns often sell for $45,000 to $95,000. You can find nice examples of |ate—classic third phase blankets that have raveled flannel reds and natural indigo blues in the $20,000 to $35,0000 range. Later examples with aniline dyes and homespun yarn will fall in the $5,000 to $7,500 price point. William Randolph Hearst, who had an empire in newspapers at the turn of the 20th century, was ravenously collecting older chief's blankets through Lorenzo Hubbell who owned the Hubbell Trading post at Ganado, Arizona. Hearst would pay up to $1,500 for a fine example. The paucity of antique weavings plied against a strong demand caused for revival Chief’s blankets to be produced, often encouraged by Hubbell. These weavings resembled the earlier third phase blankets but used synthetic reds and blues and would sell for a fraction of the cost of the old pieces. In today’s market, these revival pieces are coveted. The fourth phase chief's blankets occur after 1870 through the early 1900s and take the third phase blanket designs to an extreme with the background becoming much less important and the diamonds now the main focal element. Variant Navajo chief’s blankets use the basic chief blanket layout, but have unique patterns and designs, which do not fall into any specific phase. Antique chief's blankets continue to be one of the most collected Navajo weavings and they are still made by weavers today. 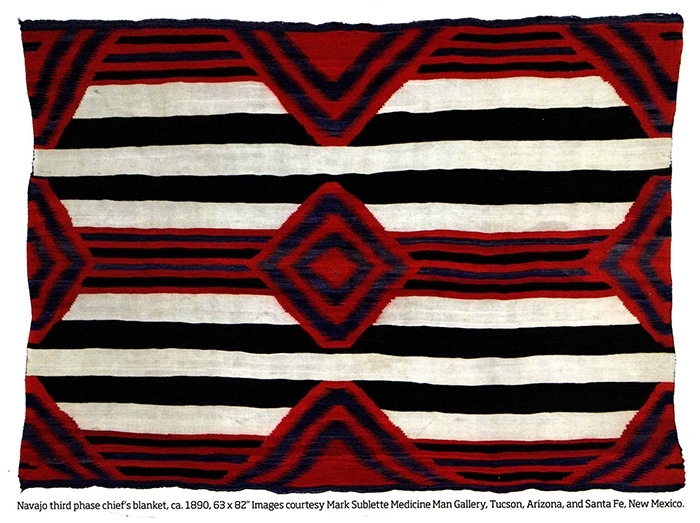 The collection of blankets shown at Medicine Man Gallery in Santa Fe, New Mexico, during the summer season represent many of the types of chief's blankets made during the last half of the 19th century.